During my early years of blogging on Xanga, I remember “Poetry Friday” being one of my favorite weekly traditions. Sometimes, people posted their own poetry. Occasionally, I would come across T.S. Eliot or Wallace Stevens or Sylvia Plath in my newsfeed. I have been thinking about keeping up with this tradition on my blog, because I find myself more immersed in poetry these past couple of years than ever before. I am even dedicating myself to a study involving William Blake, which is beyond frightening. Today, I want to share a poem called “Twisted like Dogwood” by Rebecca Latour published in the Kenyon Review. 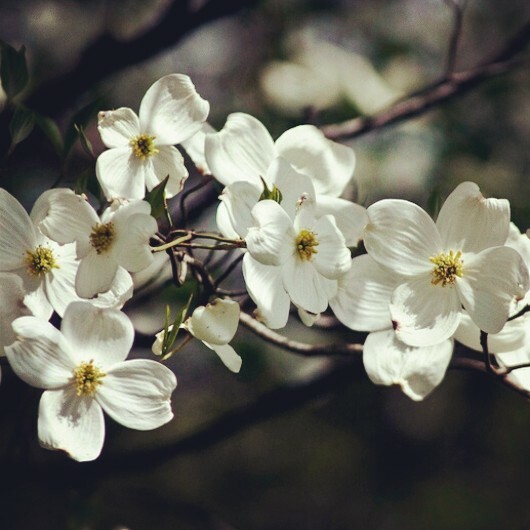 Dogwoods have been blooming here lately, and I found myself thinking of Latour’s poem this past week while buying red wine at a nearby liquor shop in a blue dress. An unusual experience. there is no going after it. through the concrete. And a boy sits next to him. He asks, got what you wanted, didn’t you? and the boy says mister? and he says well, as long as you got what you wanted. her eyes glistening like pennies. what’s her name, that little lady from the liquor store? but the wind carries her off.